Many of you probably read the article in The Boston Globe the week before last titled "Who'll Win The Battle for Dartmouth's Soul?" (Remember I'm the one who believes that you MIT students are actually reading the newspapers now.) And if you did read this article, you may have come away from it with the same sentiment I did: Thank God we're not Dartmouth. For those of you who haven't kept up with the controversial goings on at Dartmouth, let me fill you in. There's a weekly off-campus newspaper circulated at Dartmouth called the Dartmouth Review. This student-run newspaper is openly and blatantly racist. But the editorial board of this paper goes a step further than simply expressing its prejudice on paper. The Review is most famous for what has frequently been referred to as its "shock tactics." In 1982, the newspaper ran a column in "black English" titled "Dis Sho' Ain't No Jive, Bro," which insinuated illiteracy on the part of black students. 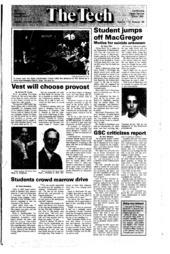 In 1984, a contributing editor taped a gay students' meeting and printed a transcript in the paper. And then, in 1986, 10 of its staffers were disciplined for attacking four ramshackle shanties that had been erected as a symbol by an anti-apartheid group. That was accomplished with sledgehammers on Martin Luther King Jr.'s birthday. The Globe reported on the most recent chapter of the Review's impact on campus, including the resignation of black music professor William Cole last month. Cole's resignation came after a long campaign by the Review staff, which at various points called Cole "a used Brillo pad," belittled his intellect, and finally crowded around him after a class in 1988 and shouted at him. The idea of a group of white conservative males spreading hatred in an attempt to suppress diversity horrified me. It also brought me to the convenient, comforting conclusion; good thing this stuff doesn't go on at MIT. I went around for nearly a week feeling generally content with the thought that in comparison to Dartmouth, MIT is a liberal, open-minded, non-discriminatory community. that we were like Dartmouth." This shocked me. Why would anyone -- especially someone at whom much of the discrimination at Dartmouth would be directed against -- want to live in such an openly racist environment? "Because at least it's out in the open," he told me. He said he believes MIT is just as racist -- that all the prejudices exist. Only here, people don't talk about it. Hearing this I was reminded of something a friend told me last year. The reason, she said, she'd virtually stopped going to most MIT parties was because when people get drunk their true racist feelings often begin to come out. She said it had become too painful to go to a party and hear someone she'd considered a friend revealing his deep-rooted prejudice, blurting out slanderous racial statements. I've known all along that some prejudice exists on campus, but I so rarely hear people talking about it that it's easy to forget -- or rather, easy to forget when you're not feeling the brunt of it. And this, according to my friend, is the real atrocity -- this state of "forgetting." At Dartmouth everyone is racially aware, people constantly discuss minority issues, minorities know the source from which most of the racism stems and students openly discuss how to combat the discrimination. And, indeed, the Globe article quotes one black student as saying, "Maybe [Dartmouth's] a good place to become conscious." Conversely, maybe MIT is a good place to remain unconscious. My friend, a former member of the Black Student Union, said he believed the sentiment on campus was a clear "better not to talk about it and pretend racial prejudice doesn't exist." And in the meantime, the student body will divide into more and more specified racial and ethnic special interest groups. And he believes that this sentiment of a generally unaware student body will continue until some racial incident, which would finally spark awareness and bring racism out into the open, occurs. Personally, I don't know what the answer is, although waiting for some unfortunate incident to occur before we address these issues certainly doesn't seem to be it. And I don't really know exactly what the current situation on campus is (like I said, I'm unaware and not alone in this). But I do know that most of the nation stands aghast at the racism present on the Dartmouth campus. That even just one person who should know (who, feeling the brunt of it, cannot remain unaware) says that MIT is worse than Dartmouth, means that something's wrong on this campus. If the source of our problem, rather than a group of conservative newspaper writers, is simply being unaware, then hopefully this column will make some more people aware. So, I bring the situation up for discussion (in hopefully a better medium than Dartmouth's Review) and hope that this discussion will lead to action. who Joanna Stone, a junior in the Department of Urban Studies and Planning, is an associate news editor of The Tech.